My first observation arriving on camp was: why are the Land Rovers pink? The answer was easy: the desert there is pink! 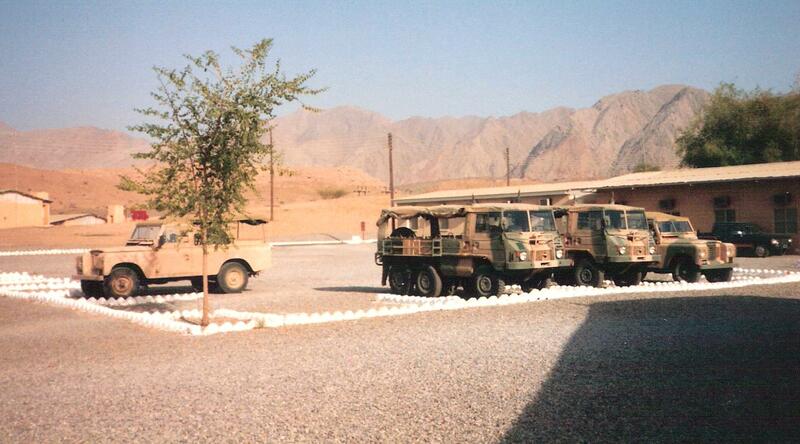 Actually, most of the vehicles were two-tone, pink and olive green, which worked well against the greys, greens and shadows that were the backdrop for camouflage in that pink part of the world. My little unit was multi-coloured, too. The majority were (are we allowed to say this?) 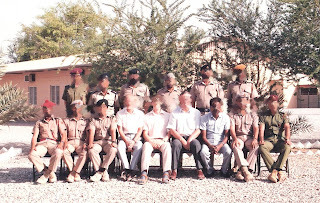 brown – Omani Arabs, and Baluchis (in the black berets). As regards the other berets, I don’t recall beyond the burgundy ones worn with the khaki uniforms, which denoted the Royal Guards regiment. Two of the crew were black: the chap in the orange beret, and the civvy who was our translator. Most of what we did was in English but several of the team were not really proficient, and prompt translation into Arabic was vital, particularly on anything technical. Yer man was really excellent – obviously he had to ensure his own understanding first; but he was one of the quickest on the uptake. It was amusing how a single sentence of mine would be translated into a couple of minutes-worth, but it was evident he was explaining as well as translating. Sometimes in such circumstances you’d wonder whether he was communicating accurately: but practical matters lead to tangible feedback, and in the long run you can tell. And he was. And then of course there were my two sidekicks and I: white on arrival and only a little browner as time went on because direct exposure to the sun would have been unwise. Everyone got on really well, including the obvious dummies, who were endearingly honest about their shortcomings and were bolstered by the rest, which is very much the army way. You will never get a full complement of top intellects in the services: it’s attitude that counts for so much, and enough of a GSOH to rub along. It became evident that banter was fine, and (as translated for me) seemed of a pretty universal military kind. 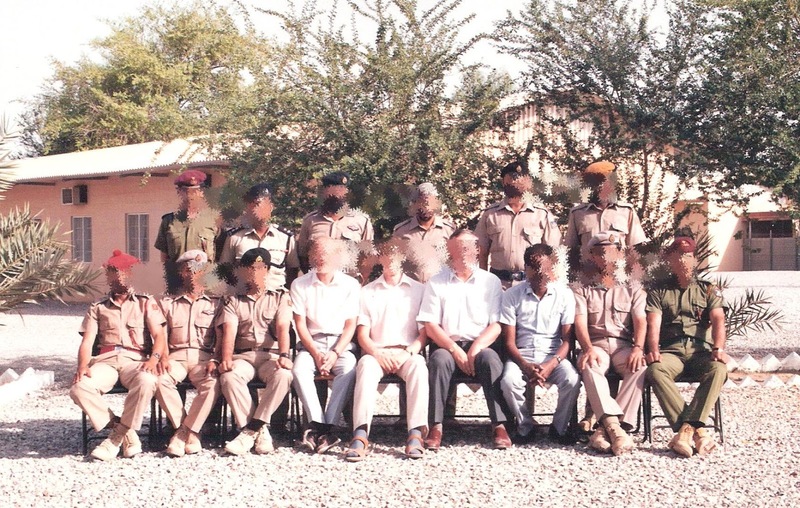 Only a very small number of the officers in camp had been to Sandhurst, so this culture was either endemic, or introduced by those Omanis and Brits who had. The former seems the most likely. The taciturn ones were the Baluchis (see earlier episodes) … but no-one was in the business of winding them up. Trips outside camp were a revelation, and I cannot fail to be in awestruck travelogue mode. Having become accustomed to the pink desert (which in our location was gravel, not sand), I was intrigued to see a band of vivid orange in the distance and was told this was dead grass. In March, the annual rains come and the grass springs up, only to die back as no further water arrives to sustain it; and it dies a shade of Trump-orange. 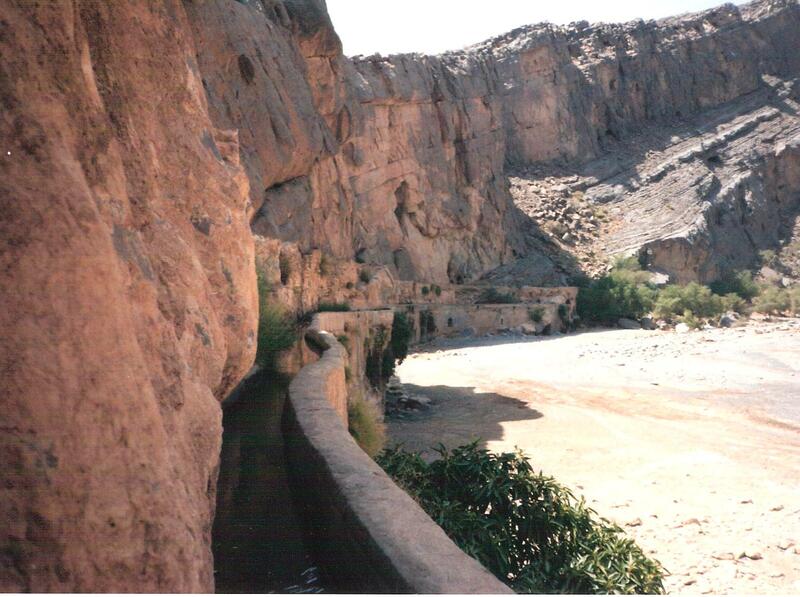 The rains also top up the irrigation system, a variant of qanat known as ‘falaj’ (plural variously afalaj or falajes) which were built centuries ago, reputedly by Persian engineers. Made of the local clay, these channels are narrow (to minimize evaporation), and deeper than you’d guess. On first inspection the water looks black and still: but put your finger in and you find it is running pure and strongly along the many miles of fine gradient these master irrigators carefully engineered, contouring around and between hills, always on the shady side wherever possible. It’s a system you can find on a much smaller scale feeding water-mills in the UK, as well as in the Moorish areas of Spain, as I recently discovered (I may write a whole post on this one day). 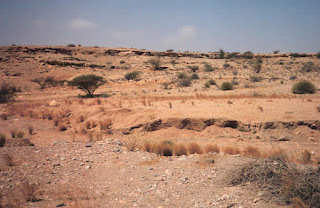 Any village that doesn’t have its own oasis will be built over a falaj, which is split into several smaller channels as it goes under the houses, then re-converges to go on its way. (Again, you can find this system in the UK, where diverted streams ran through big Cistercian monasteries.) 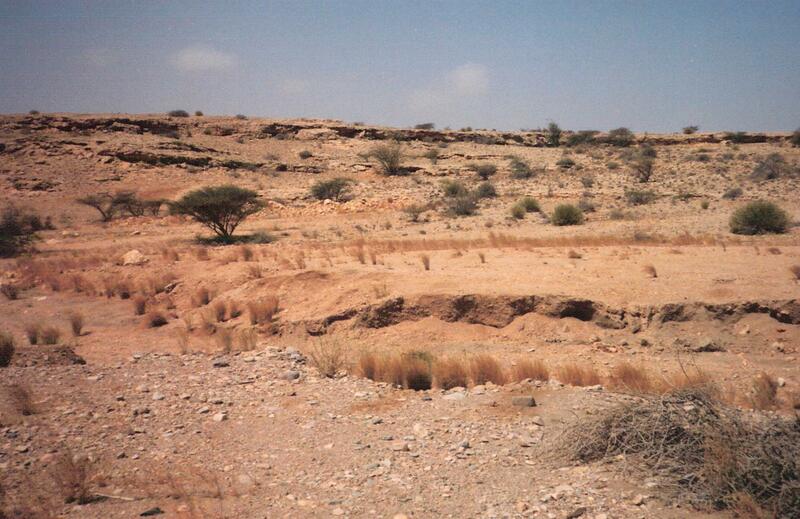 Each house has a single hole-in-the-floor over one of the sub-channels, through which the occupants are permitted to dip a small bucket to draw fresh water. This is the only use they may make of the hole … probably on pain of something horrible. 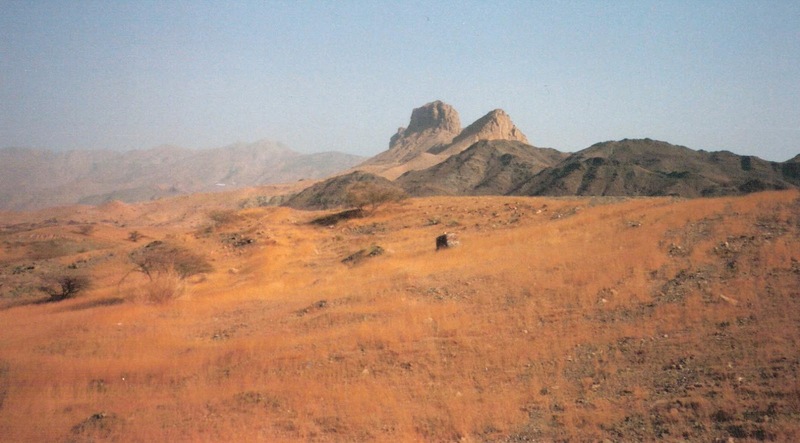 As mentioned in Part1, although the rebel village of Tanuf was thoroughly shot up by the RAF, the falaj there was carefully rebuilt. There would be villages downstream that depended on it. Pink, green, black, white, brown, orange, burgundy ... the colours of northern Oman. Reminiscent of the levadas on Madeira. Good to read on a cold and very wet West Country day. Pink Landrovers would work in the mud 'round 'ere too. Oman and not NI? You dodged a bullet there.